Should You Get A Sponsor For Your Event? Sponsors have money and you've got expenses. Is combining them a win/win, a win/lose, a lose/win or a lose/lose? When you're holding an event, the hotel or restaurant won't give you a room or refreshments for free. You may also have costs for equipment rental, mailing, advertising and prizes. A sponsor might cover some or all of these costs but nothing's free. Sponsorship isn’t a gift: you’re getting a loan that you repay with future sales. Let’s look at the advantages and drawbacks of getting a sponsor. Your sponsor might provide a projector (though these are quite affordable these days). If you have a projector, the sponsor could bring a spare. Since your sponsor has seen your competitors’ events, you get valuable tips on how to improve yours. Remember that what you do well will turn into tips for your competitors. Your sponsor may provide a speaker. That's helpful if the topic is outside your expertise or if you position yourself as a concierge or host. Sponsors refuse more requests than they approve. So sponsorship brings an endorsement with it. You inherit some of your sponsor's credibility. This may nudge an undecided prospect into attending. Your sponsor's goals differ from yours. Yes, your sponsor wants (and expects) your business. That's a win/win. But sponsors want much more. Sponsors want to see what you're doing so they can tell your competitors what works. Why? You're usually a small fish. They’d make much more by getting a bit more business from their other fish than from all of yours. A sponsor probably won't disclose where they pick up tips. They may even give you credit. Regardless, you've unwittingly given away your intellectual property. That may matter to you since small tweaking (in the invitation, say) can have big impact on results. By dictating the budget, your sponsor has a say in your venue and topics. Your sponsor may even want or expect time on the agenda. Before you book the venue, you may need to get pre-approval. In some ways, you're working for them. That's the power of holding the purse or wallet. Your sponsor is probably better known than you and your company. Your branding loses impact. Will potential attendees think that you're reluctant to pay your own marketing bills? Will they expect biases in your content? If you're sponsored by an insurance company, you can expect more emphasis on segregated funds than other investments they’re prohibited from selling. Since we are inundated with advertising everywhere we turn, a commercial-free oasis has charms. You are selling something yourself, after all. With the sponsor, your perceived impartiality decreases: your audience expects you to sell or promote that company. During the question period, you have a tougher time answering questions because every product has drawbacks and you don't want to offend your sponsor. If you don't want to advertise for the sponsor, you can split the costs of your event among the presenters if they're also selling something. You’ll all have a stronger incentive to get results. Maybe you can find an unrelated sponsor. Suppose you're selling financial services to wealthy farmers. Maybe a tractor, truck or seed company would like access to your audience. Here, it helps to have contacts in place --- ideally people you've helped in the past. Rather than owe a sponsor, you can foot the bill yourself. You believe in your event, don't you? Don't be over self-confident with your first impressions of people. First impressions last. We know their power. Even if we're wrong, we're eager to filter reality to fit the pegs we've already selected. Did you notice the scissors in the image? They're within the box the interviewer is drawing but out of sight. Our snap judgments lack context. Some people are great at socializing or presenting. You want them on your team. You may later find they're full of fluff, don't meet deadlines and fuel the flames instead of extinguishing the fire. Maybe they drink too much. Maybe if they're overly profane. Maybe they leer at the serving staff. In The New-Boy Network (free PDF), Malcolm Gladwell reminds us that first impressions are based on one context. Someone good in an interview may not be a team player on job. The article is worth reading online or in his newest book, What the Dog Saw. You can't stop your prospects from making snap judgments about you. Can you influence them? Deciding too quickly creates anxiety. Deep down, we know we might be fooling ourselves and that others may notice. Your prospects face this this anxiety too. Help them see you in different contexts. Hiring a video crew to follow you around isn't practical or desirable unless you're trying to get into reality TV. Let prospects get a first impression without the hassle of meeting you. Display samples of your work. Show them testimonials. Describe your processes. Give proof of your philanthropy. Let them see you. Let them hear you. The only practical way is online. You don't need everything at once. You can add and modify in the future. If the prospects agree to meet, you've already planted the seeds for a long relationship ... if you have an equally positive first impression of them. Expectations change experiences: what do you call yourself? PS You've also got to deliver results. 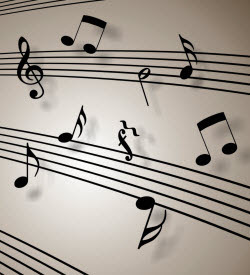 Where's The Music In Your Store? We're shopping at an outdoor mall in Pennsylvania with stores like Banana Republic, Izod, Nike and Tommy Hilfiger. It's just after opening on Sunday March 14, the day Daylight Savings Time ended. When clocks "spring ahead", an hour of sleep vanishes since people rarely go to bed an hour earlier. That means small crowds and lots of parking. We're also up because a waffle maker in our hotel's breakfast lounge triggered a fire alarm at 6:48 AM. Even without people, there's sound everywhere: music. Lively and mellow. No deep messages, though. Variety. No heavy metal. Some stores play current hits. Others pick classics. Crocs played commercial-free Sirius/XM satellite radio. Music makes shopping more enjoyable. This inexpensive extra helps establish an atmosphere. Hey, can we go to Banana Republic to check out the tunes? Not quite. The music isn't enough of a draw on its own but adds to the experience. Other atmospheric elements are lighting, flooring and location. And smiling staff. And even crowds. Your choices send messages about your quality and prices, whether value or premium. You wouldn't expect paper napkins at a nice Italian ristorante or cloth napkins at Pizza Hut. Maybe the music is a modern replacement for bland Muzak. Maybe the tempo changes during the day. The music definitely beats silence and the mundane chatter of other shoppers. Shoppers probably linger longer and spend more. Are you seen as a commodity (like a netbook)? PS If you visit clients, you're bringing part of your store. What atmosphere accompanies you? The Art of Marketing conference took place last Tuesday, March 2 in Toronto. We were treated to insights from Mitch Joel, Seth Godin, Max Lenderman, Sally Hogshead, James Othmer and Dan Heath. Quite a lineup. Presenter after presenter gave example after example of how people have changed. Old approaches no longer work. Claims seem self-serving, but think of what the presenters were selling: books. These weren't the high pressure, take-my-$$$ course-and-your-life-will-turn-around crowd from the Real Estate & Wealth Expo (see secrets to billionaire success). The obsolescence of old marketing approaches helps you. When you're in a new environment, the old maps won't help you but your compass will. Principles still apply since people are fundamentally the same inside but methods have changed. The good news? The new techniques are virtually free and work better for smaller marketers. A physical presence matters too, but your first point of contact is probably from a web search. Why not post photos of you and your facilities? Why not use video and audio to give online visitors a test drive? Give visitors compelling reasons to visit contact you, subscribe for something free or visit you. If your gas station is no longer on the main road, your traffic will drop. When driving between Ottawa and Toronto, we used to stop at an Esso station at the junction of Highways 401 and 416. Until the highway was rerouted. Now we don't even know how to go to that gas station --- if it's still there. 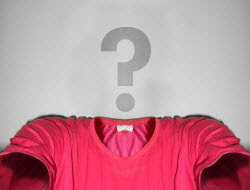 What do you lose by being visible where your customers already go? If the popular place to be changes, you can easily move. Your website stands alone but search engines direct traffic to you for free. If you have a destination. Think back to your last $500 purchase. If you couldn't find the vendor's website, how would you feel? Would you look for another vendor? Even if you would not, your clients and prospects might. Why take that risk? Once visitors follow directions to your destination, they want to know that you're good. The design and content on your site help build trust but that may not be enough. Testimonials help if they're left by real people like them. A sprinkling of negative comments boosts your credibility because visitors see a range of opinions. None of the three essentials takes much work, much time or much money. The challenge is getting started. how does anyone know you're any good? where is your Google Profile? Talk's cheap but typing's a hassle. I'm starting to use Dragon NaturallySpeaking Preferred version 10.1 running under Windows 7 (64-bit). The installation went smoothly and the upgrade was free since I already have version 10.0. I didn't bother to check what's new in this release but it's probably designed to work with Windows 7 and 64-bit operating systems. Regardless, each new release of Dragon gets better. This time, I'm very impressed. I'm dictating this post and so far I haven't seen a single mistake. That's amazing. Normally there would be a couple of errors by this point. If you're skeptical about the value of speech recognition, read this earlier post. What's even more impressive is the microphone. Normally I use a quality external microphone. That means another piece of equipment to carry around and setup. 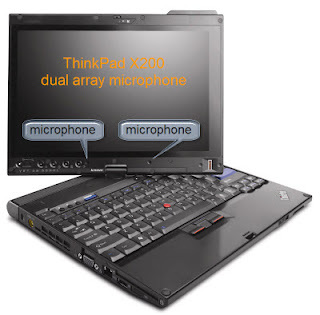 This time, I'm using the microphone array built into my ThinkPad X200 tablet and dictating from an arm's length away. Really. A microphone array means two (or more) microphones connected. This helps with error correction. Years ago, I used the Andrea SuperBeam array which I placed on top of my monitor. Later I switched to a Bluetooth wireless headset from BlueParrott. Most recently, I used the Samson C03U microphone which I use to record the Riscario Radio podcasts. (56 and counting). Using internal microphones is best and that's now possible. Windows 7 has speech recognition built in. 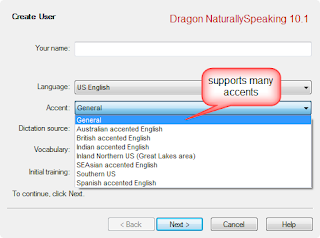 While it's improved over the version in Vista, Dragon NaturallySpeaking is much better. PS If you try speech recognition and aren't satisfied with the results, consider a better microphone or headset.